What looks to be "P-28" appears on the # 4 engine cowling [click on the engine shown above where to 2 dots appear to enlarge that area]. Another identifying marking is the front nose wheel cover. It's painted with a series of dots - they start out large and get progressively smaller moving left to right [click on the area of the nose wheel cover to enlarge that area]. Additionally the same nose wheel cover markings can be seen in the photo of Crew 28 below. Charles B. Miller, Col USAF Res Retired (Airplane Commander of Crew 28) confirmed the nose wheel cover was painted yellow with large black dots. Crew 28 as many of the other crews of the 39th was formed in Salina, KS. While the exact missions are not known at this time, Emerson Sollom, Radio Operator states they flew 29 missions – the 29th being the “Show of Force” over the “USS MISSOURI”. The crew had flown 5 to 7 missions when LeMay had stated that the bombing missions were going to start bombing from an altitude of 5,000 instead of the 21,000 to 23,000 feet previously. On the next mission – Tokyo 17 square miles of the city were burned out recalls Sollom. “I believe our crew had flown 7 missons when a new crew came in from states. The enlisted men came into our barracks. The radio operator of that crew bunked next to me so I got to know him. Of course that had a lot of questions and our answers were some what exaggerated. They practiced bombing some of the small islands and rocks not populated in the Guam area. After finishing their practice of a few days they were ready for their first real bomb-run. 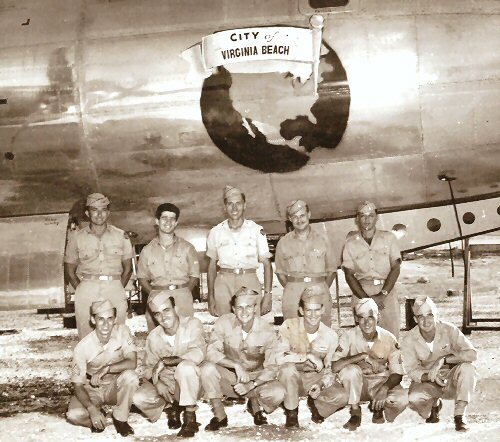 The group took off from Guam including the new crew. It was common practice to fly pretty much solo until we reached the rendezvous point, usually a couple hundred miles off the coast of Japan. This point was an uninhabited island that we circled and then after all the planes got there, we got into formation and flew the bomb run. As we were circling the new crew was right behind our plane, out of the sun cam this Jap Zero, aimed his guns directly at the plane behind us, hit them and the plane began to fall 20-some thousand feet into the ocean and disappear. Next day supply came into the barracks and packed up their personnel belongings. Crew 28 was among those that flew the group’s first mission on 12 April 1945. On this mission, members of this crew were awarded the Distinguished Flying Cross.